Another sturdy, well-constructed, two-sided premium mattress set to come from Restonic that has a low price tag; especially when compared to mattresses that are anywhere close in specifications. The Comfort Care line has won both Women's Choice Awards and Consumer's Digest Awards every year for the past 8 years! It goes without saying that they are a great value and a quality product. This one falls right in the middle between firm and plush; the strong, tempered coil system offering a high level of support, while the pillow top gives you that initial cushiony feel that you may need to fall asleep. 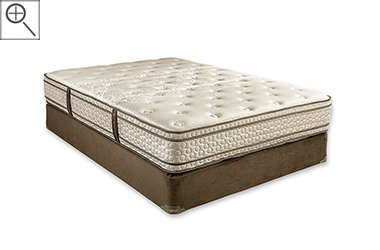 Double-sided (flippable) mattresses nearly always last much longer than single-sided ones. I highly recommend this mattress to anyone seeking a supportive, long-lasting, thick pillow top mattress.